How To Install Mobdro : Complete Guide To Install Mobdro On Your Devices – If you enjoy watching streams of documentaries, movies, sporting events, and TV series then Mobdro is the app for you. a tool that constantly looks for free video streams available on the web and makes them accessible on your mobile device. The Mobdro app was developed specifically for the Android operating system but it is not officially available from the Playstore. You have to use your Android gadget to directly get the Mobdro app on your device. You can follow my guide below if you want to learn how to install Mobdro on the above mentioned devices. Each device is given its own guide. Just select your gadget and follow the steps to install Mobdro on your device. First off, we’ll install the Mobdro app on your Android handheld devices like smartphones and tablets. Just follow the steps below to get the app on your gadgets. Step 1. Make sure that “Unknown Sources” is enabled on your device. Go to “Settings”>”Security”, then scroll down until you see “Unknown Sources”. Tap the toggle to enable it. Step 2. Visit this link using the internet browser on your Android device(s). Click the “Mobdro Download” button to start the Mobdro app download. Step 3. Tap on the file you downloaded to begin installing Mobdro on your device. Step 4. After installation, you will see the Mobdro “icon” on one of your screens or in the app drawer. Tap on it to start using Mobdro. You can watch the video below showing how to install Mobdro on an Android. Next, we’re going to install Mobdro on the Android TV Box. 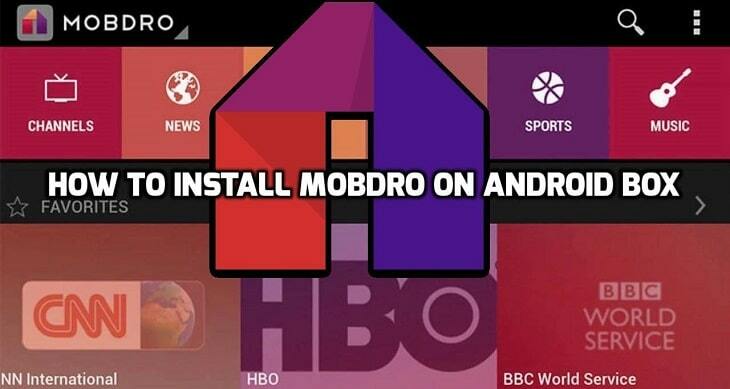 The steps below will show you how to install Mobdro on your Android TV Box. Installing the app on an Android TV Box allows you to watch videos on a bigger screen. Follow the steps below to have Mobdro on your TV box in no time. NOTE : Since Mobdro is not available from the Playstore, you cannot direct install it using your Android TV Box. You have to to download the Mobdro apk file and then “sideload” it on your TV Box to enjoy free streaming of multimedia contents. Step 1. Connect your Android TV Box to your TV and turn on the device. Step 2. Once on the “Home” screen, use the “Search” or scroll down to “Settings“. Step 3. On the “Settings” screen, find the “Security & Restrictions” option. Select to open the settings. Step 4. Enable the “Unknown Sources” to allow 3rd party app installation. Tap “OK” in the pop-up window to confirm the selection. Step 5. Go back to the home screen and open the “Browser” app installed. Step 6. Navigate to this link to download the latest version of the Mobdro apk. Let the download finish. Step 7. Open the “File Manager” app and go to the “Downloads” folder. Select the Mobdro.apk file and open it to start installation. Step 8. A prompt will appear saying “App Installed“. Choose “Open” to launch the app and enjoy free streaming of videos and other contents on your Android TV Box. The video below shows how the process is done. The following guide will show you how to cast Mobdro streams to your TV via Chromecast. We’ll use an Android device with Mobdro installed for the procedure. Step 1. Connect your Chromecast to your TV via the HDMI port. Step 2. Using your TV’s remote control, select the HDMI port where your Chromecast is connected. Once the input source is selected, you will see the Chromecast Home Screen. Step 3. Connect your Chromecast to your Wi-Fi network. Step 4. Visit the link on using the “Browser” on your Android device to download the Chromecast app. Step 5. Install and open the Chromecast app on your device after downloading the file. Step 6. On your Android device, go to the “Wi-Fi Settings” and select your Chromecast. You will see the same device on your connected TV. Step 7. After selecting your Chromecast, open the Chromecast app on your Android device. Step 8. Select “Setup” and follow the instructions given. Choose your country and click “OK“. Step 9. You should now see a “code” both on your Android phone and your TV. If the code matches then choose “I see the code“. Step 10. Select “Set Name” to give your Chromecast a name. Step 11. Connect your Chromecast to your Wi-Fi Network by entering the password and then choose “SET NETWORK“. Step 12. You are now all set to cast. Open the Mobdro app on your Android device and start streaming to your TV via Chromecast. Watch the video below to see a sample Mobdro stream on TV via Chromecast. You can also use your iOS device with Mobdro installed to stream content to your TV using Chromecast. First, you have to install Mobdro on your iOS gadget which is next in our guide. Unfortunately, Mobdro for iOS is not yet available as of this writing. You can easily install an alternative Mobdro app for your iOS device like CinemaBox, Popcorn Time or ShowBox and get the same result. You can check out our guide, “Mobdro Alternatives: Top 5 Mobdro-Like Apps For Android, iOS and Windows PC“, to learn how to install Mobdro on your other devices. Kodi is another video streaming app that can be installed on any platform. Add-ons can also be added to the Kodi app which makes it very versatile. One “must have” add-on for Kodi is Mobdro. Follow the steps below to get Mobdro on Kodi. Step 1. Launch the Kodi app installed on your device. Go to “Settings” then select “File Manager“. Step 2. Click “Add Source” in the File Manager. Click “None” and the default “Browser” will open. Step 3. Key in this URL in the Browser – http://lvtvv.com/repo/. Click on “OK“. You will be prompted to name the repository. Step 4. Go back to the “Homescreen“. Navigate to “Settings” > “Add-Ons“. Step 5. Choose “Install From Zip File“. Step 6. Navigate to the “Repository” you created. Step 8. Wait for the “Add-Ons Enabled” notification. Step 9. Choose “Get Add-Ons“. Find the AH Add-on repository then select it. Step 10. Click on Video Add-Ons. Step 11. Select “Mobdro” then click “Install“. Step 12. Wait for the installation to finish then you can launch Mobdro to enjoy free video streaming. Again, you can watch the video below to see how to install Mobdro on Kodi. For Mac users, installing Mobdro on your devices can be done by using an Android emulator. You can follow the guide below to get Mobdro on your Macs. Before you can install Mobdro on your Mac machines, you must have an Android emulator already installed on your device. You can follow this guide on how to install the Bluestacks Android emulator for the Mac. After installing the emulator, you can now proceed to the guide below to get Mobdro installed on your Mac. Step 1. Click this link to download the Mobdro apk file to your Mac. Step 2. Launch the Bluestacks App Player on your Mac. Step 3. Locate the Mobdro apk file you downloaded and drag it to the Bluestacks App Player window. Step 4. The App Player should start installing the dropped apk file. You can also double-click on the apk file and the Bluestacks App Player will install it automatically.Wait for the process to finish. Step 5. You can now launch the Mobdro app on your Bluestacks App Player and enjoy! Here is another video showing how to do the procedure. We already have a guide for the last two devices on the list. You can click this link if you want to learn how to install Mobdro on your PC. Also, for Smart TV owners, this link will take you to our guide on how to install Mobdro on your Smart TV. Mobdro is a great app to install on any of your devices if you enjoy multimedia streaming. Our comprehensive guide will make mobdro installation even easier. Please share this post with your friends if you found it useful. Leave a comment below to let us know what you think. Posted in Uncategorized and tagged How to install mobdro, How To Install Mobdro : Complete Guide To Install Mobdro On Your Devices, how to install mobdro on android tv box, how to install mobdro on Chromecast, how to install mobdro on iphone. how to install mobdro on iOS, how to install mobdro on Mac, how to install mobdro on PC, how to install mobdro on Smart TVs, install mobdro on Kodi.